A good web designer has the knowledge to create a user-friendly website that visually engages the audience. It will be pleasing to look at, easy on the eyes and fully functional. He will have all the basic knowledge needed to design a website, which includes a complete understanding of the key principles of web design. He should also have the ability to determine your needs and make suggestions that will provide you with the most functionality, while finding ways to make your site stand out. He should have the knowledge to create a site that is easy to maneuver while providing users with a positive experience that will encourage them to come back again. For this reason, experience is one of the main qualities you’ll want to look for when choosing a web designer. An experienced web designer knows what the targeted audience responds to the best and what designs work best with your particular industry. He’ll know if the design you’re considering is a good one or if changes should be made to make it more user-friendly. Furthermore, he won’t be afraid to tell you if something you’re considering is outdated or simply not a good idea for your site. Less experienced designers may be tempted to simply do what you ask without pointing out any problems that may be associated with a particular feature or type of design. However, someone with experience understands the importance of discussing any potential problems before even beginning the project. Look for a web designer that is creative, ambitious and that has successfully created websites that encourage users to browse around to see what you have to offer. In addition to finding a knowledgeable and experienced web designer, look at his personal qualities, too. 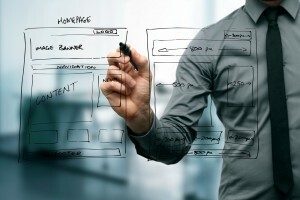 Personal qualities help distinguish a good web designer from a great one. For example, the designer should have good verbal and active listening skills. Many problems that often occur between designers and the companies they work for comes from poor communication. The designer thinks he knows what you’re looking for but later learns you had two very different visions in mind. This can be avoided simply by going over all the details right from the start and making sure everyone is on the same page. When you hire your web designer, think of your future needs and look for an individual or a web design firm that can provide updates and other services as your company grows. This way, you’ll have a web designer that you know and trust when you need this type of service and you won’t have to look for someone new every time you need to make a change. Look for a designer with integrity and a passion for his work and for someone that you can talk to comfortably. You’ll be working with this person off and on for a long time so you need to get along with each other well. When you work together as colleagues, things can go much smoother and more efficiently for both of you.